The future success of education depends on technological and pedagogical innovation. Unbridled by the physical constraints of both time and space, virtual spaces transcend many limitations of the typical classroom, where learning depends on presence and physicality. 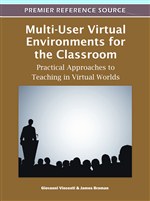 Multi-User Virtual Environments for the Classroom: Practical Approaches to Teaching in Virtual Worlds highlights the work of educators daring enough to teach in these digital frontiers. Instructors will find cutting-edge teaching ideas in the theoretical discussions, case studies, and experiments presented in this book. These insights are applied to variety of subject areas and pedagogical contexts, including learning foreign languages in virtual environments, examples which encourage educators to design and develop new worlds of learning inside the university and beyond. The part I authored focuses on the 3-D training I put together while working for Crompco, LLC.